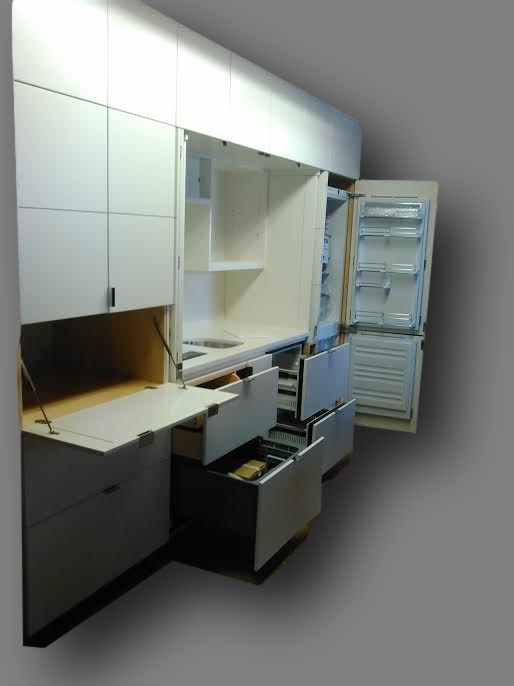 After over 22 years of explaining the differences and advantages of our Alternative Kitchen Solutions, I think it is fair to say that YesterTec’s Workstations are definitely Beyond Kitchen Cabinets. Still, they are not the most appropriate choice for all kitchens mostly due to the cost of producing truly 3 dimensional objects. 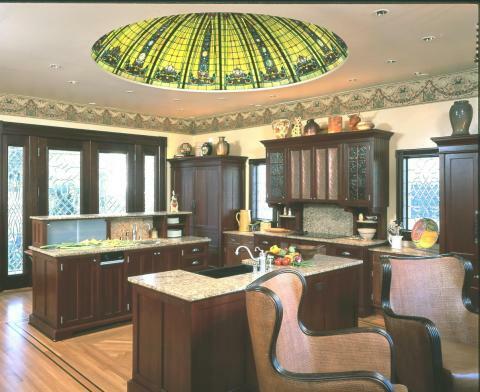 But I can almost bet that there is not a kitchen that could not be physically designed using YesterTec workstations. A bold statement I know, but I would welcome the challenge of designing our units into the many situations that are out there. And it is because I have already designed so many kitchens for so many different floor plans that I can say this. The versatility of the highly functional designs are what makes this statement possible. Beyond Kitchen Cabinets basically means that workstations, whether they are our original freestanding pieces of Kitchen Workstation Furniture, or our Mini-kitchen Armoires, or our Stealth Kitchen Modules, are all so different than cabinets that new design solutions are possible that go ‘Beyond’ the capabilities of what normal cabinets can do. Conversely however, cabinets can do things that Workstations can’t do, but again, it is usually the cost that is the determining factor. And I wish that wasn’t so, but it is a reality. 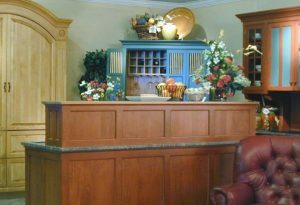 Three dimensional pieces of furniture that are finished on the fronts, both sides and tops go way beyond the cost of producing simple cabinet ‘boxes’ that are finished only on the front. 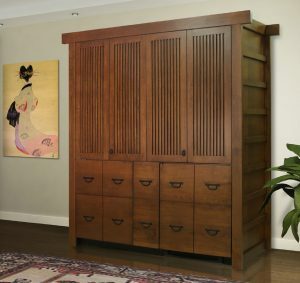 In addition, the workstations are 29” deep, providing great utility per lineal foot, but the longer drawer boxes and slide hardware, even the wood sheet goods are non-standard and costly. Not to mention finishing the 30 inch (plus) stone countertops on all sides. Our UL Listed appliance hiding technology goes way ‘Beyond’ what any other cabinet manufacturer in the WORLD does. We constantly see examples of ‘Hidden Kitchens’ prominently displayed that are built by some of the world’s most prestigious kitchen cabinet manufacturers. 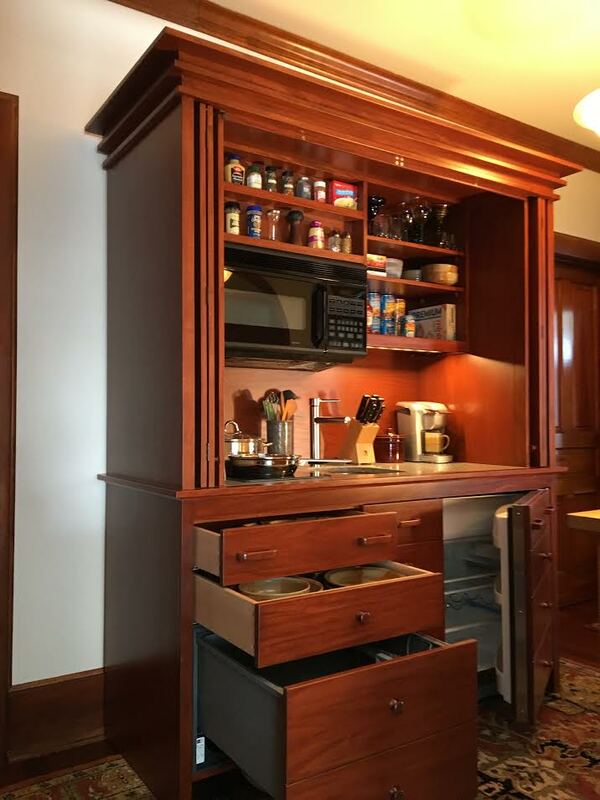 But are these hidden kitchens safe? Check out this article form Remodelista. Do you see all the ‘hot’ appliances, even gas appliances hidden behind doors? This is extremely unsafe, unless there are safety features built-in that do not allow these appliances to operate if you can’t see them. 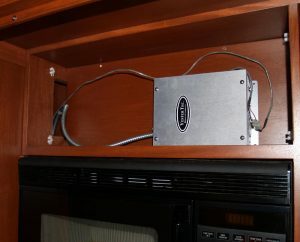 Safety is why we build these features into each of our enclosures that hide the ‘hot’ appliances. So for now, until there is more acceptance of the concept of Workstations as a mainstream design option, when there will be more producers who can mass produce the different models, I’m afraid to say that we will remain in the more upscale luxury segment of the marketplace. Next ArticleHGTV, Love it or List it! Previous ArticlePlease Hide a Kitchen in my Foyer!